Excellence is an ability which can be accomplished through diligent work and commitment. There are no alternate routes in achieving success. Smart work and good rapport from your team are the key factors on attaining excellence. Consistently, monthly social function we’re done to showcase the best employee and department in Alwafaa Group – Best Digital Marketing Agency Dubai and Web hosting company in Dubai. The assessment depends on different criteria like reliability, dress codes, individual and team work, creative plans, work productivity, consistency and smart work. 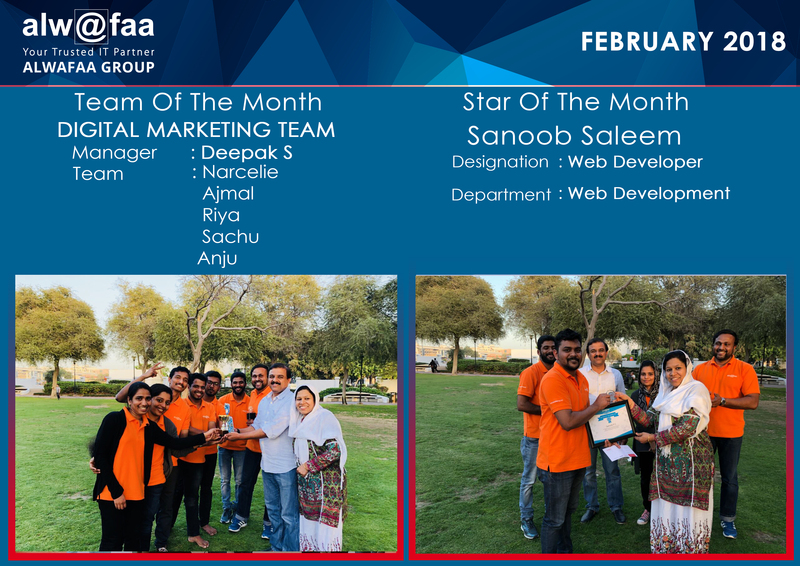 After the tight selection, The star of the month has been awarded to Mr. Sanoob Saleem – Web Developer of Web Development Team and the Best Department goes to Digital Marketing Team – Ajmal, Narcelie, Anju, Riya and Sachu, led by Mr. Deepak (Digital Marketing Manager) for the month of February. The awards were announced on 10th February 2018 @ Al Twar Park in Al Qusais, Dubai, UAE. CEO Mr. Muneer and General Manager Mr. Sameekh graced the occasion with their presence. Alwafaa Group – Digital Marketing – Leading SEO, Google AdWords, Social Media Marketing Company in Dubai for all your Digital & Online needs.